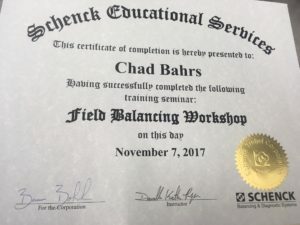 Acme Armature Works Inc. owner Chad Bahrs recently completed a Schenck Balancing and Diagnostic Systems Field Balancing Workshop training in Chicago, Illinois. Led by a Schenck training specialist from Deer Park, New York, the workshop was designed to provide instruction on assessing damaged bearings in electric motor assemblies, while highlighting the proper use of portable vibration analyzers, which are the main tools used in field balancing scenarios. “It was a very informative workshop, which gave a lot of details on what to look for and the different signals to checks when doing field balancing,” Bahrs said. “The portable vibration analyzer can be a tricky machine to figure out. Each type of portable vibration analyzer seems to act a little bit differently. “We spent quite a bit of time learning the different portable vibration analyzers, which I found to be quite interesting and useful in the field balancing work we do on a regular basis,” he said. According to Bahrs, Acme Armature Works places a strong emphasis on offering top-flight one-site balancing services to its customers throughout Sheboygan County. “Accurate vibration analysis can provide the necessary information to evaluate an electric motor’s condition, identify symptoms to avoid on-going damage, determine the cause of damaged components and other a prognosis for remaining service life,” Bahrs said. “Providing high-quality on-site balancing services, including vibration analysis can make the different between maximum production efficiency and large-scale failure. “At Acme, we offer a complete range of services to diagnose, troubleshoot and correct machine condition through the use of the latest Schenck technology,” he said. The workshop also touched on the importance of using portable vibration analyzers in the shop, as well as in the field. “In addition, to using the portable vibration analyzer in the field to test motors and find problems, the analyzers can be used to double check our work in the shop,” Bahr said. “We test run each motor after balancing them as an extra step of quality control. I feel it is important to utilize this step to verify that we did a good job of balancing a motor. “As part of our commitment to quality control, we document each field balancing job we do according to the EASA accreditation AR100 specs that we use as our standard guideline,” he said.